Fruitless Pursuits: Bands Playing As Other Bands For Halloween! In the meta event of the day, we present bands dressed up and playing as other bands! It's actually a really cool yearly event. Every Halloween, South Jersey's Gradwell House recording studio presents the best bands in the area in a Halloween concert that is loaded with hilarity and awesomeness. In recent years bands have performed as Blues Traveler, Pearl Jam, Bruce Springsteen, The Smiths and The Go-Gos. This year was as good as ever with Willie Nelson, Zack Attack, Wham!, Talking Heads, Pavement, Jesus and Mary Chain, and Guided By Voices. Check out a song from each band after the jump! 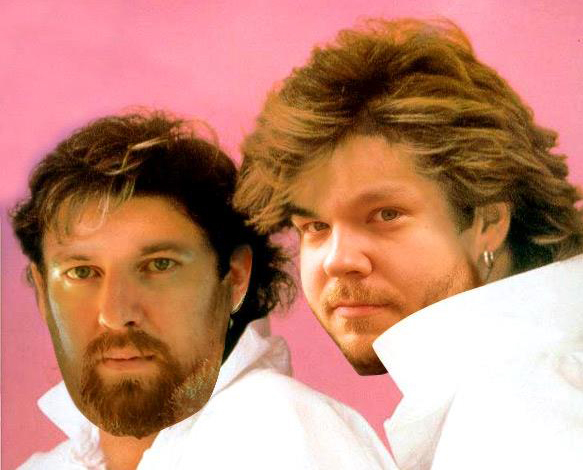 Steve Poponi and Dave Damm as Wham!